Here's a step-by-step walkthrough of my process. Please contact me if you have any questions about my method. I use slabs that are rolled the evening before and stiffened up sandwiched between sheets of drywall. Beveling edges are joined with this handy-dandy beveling tool. Slabs have to be stiff enough to stand up but moist enough to be able to bend without cracking. Adding a tiny coil to enforce the joint. I work in small batches. Here is a small collection of bowls with slip trailing added. Container with dots of slip added and drying. Another small collection drying before black terra sigillata is applied. Pieces after spraying and buffing with a very soft piece of fleece. Notice the newspapers with a voter guide. Sometimes I start reading articles in scrap newspapers and I have to bring myself back to the task. Sometimes I spray black terra sigillata and for that I have to wear this heavy duty respirator. I am moving more towards brushing to avoid all this heavy duty safety measures. Brushing is much safer since particles do not get airborne. This part of the process is what I love the most. I am using dental tools to scratch through very thin layer of terra sigillata. 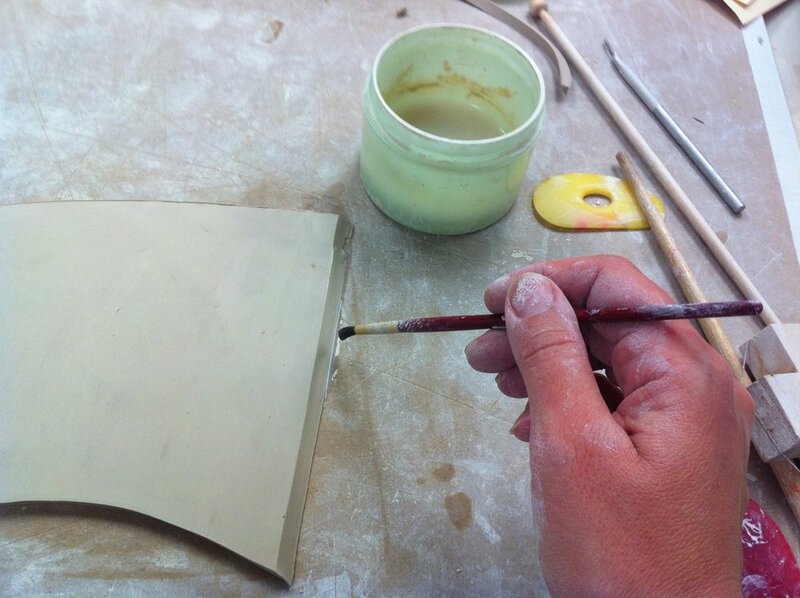 Adding details – Lines are very thin and delicate. Pieces ready to be fired for the first time to 1850 F. After the first firing I glaze the insides with transparent glazes and add other glazes as details to my designs. It is all fired for the second time at 2230 F.
Work loaded in the kiln. 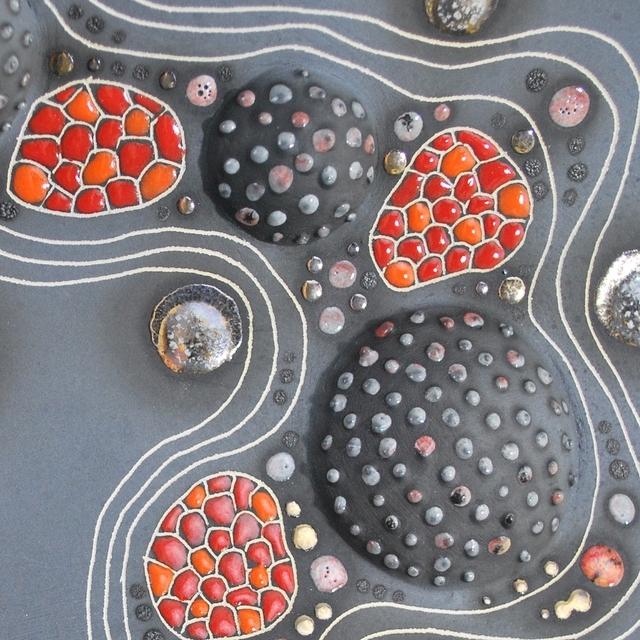 Detail of a fired surface with dots of glazes added. Please contact me if you are interested in my work, have questions about the process or would like to add your name to the mailing list. I send 2-3 newsletters a year and I never give away addresses.